Stocks and Shares ISA Vs Cash ISA - Which Is Right for You? To do this we’ll look at a few key areas, to examine how these different types of ISA work and what this might mean for your money if you were to opt for one over the other. While reading, though, do remember that you can have one of each ISA type if you would like to spread your money around a bit. 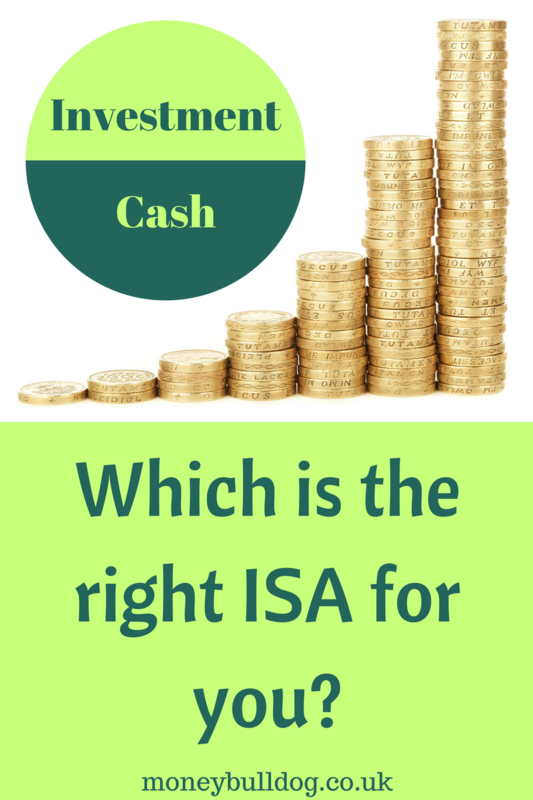 The first major difference we need to consider when thinking about whether you should go for a Cash ISA or a Stocks and Shares ISA is what will happen to your money when placed into each of these ISA types? When you deposit your money into Cash ISAs, you are effectively saving your money in the same way that you would in a standard savings account but you will enjoy the tax benefits that come along with saving via an ISA, which could help you to keep hold of more of any interest earned rather than paying a portion to the tax man. When you invest your money into Stocks and Shares ISAs, your money is invested into the stock market so instead of earning a set rate of interest, you will be looking to benefit from rising stock prices and dividend payments instead. You will still enjoy the tax benefits of investing through a Stocks and Shares ISA rather than a standard online dealing account, though. This key difference in how your money is used in these two ISA types leads us on to our next point of difference that needs consideration. When we say security of your money in this case, we’re not talking about online fraud and that sort of thing, but more the security of your initial capital and regular deposits and whether there’s a chance that you might lose some of your money. With a Cash ISA, as long as you save with a provider who offers FSCS protection and your deposits are eligible, the money you put into it is more than likely not going to be at risk and you will simply earn interest on any money you put in. Your initial capital is safe. With a Stocks and Shares ISA, however, this is not the case. This is because with a Stocks and Shares ISA the money you put in will be invested into the stock market, either in a way that you choose or by your ISA manager. As the value of investments can rise as well as fall your initial capital is at risk, and you could get back less money than you put in if the market were to turn against you. This basically means that if you put £10,000 into a Stocks and Shares ISA you could quite possibly only get £7500 back (or perhaps less). Of course, you may end up getting £20,000 or more back if things go well with your investments. That’s the risk you take with a Stocks and Shares ISA Vs a Cash ISA. With the above in mind, whether you opt for a Cash ISA or a Stocks and Shares ISA may well depend on your attitude to risk. Now we come to whether you need to have easy access to your money or not, and how quickly you’ll need that access. Cash ISAs come in two main forms, Easy Access ISAs – which are usually variable rate ISAs offering quick or possibly instant access to your savings – and fixed rate ISAs which usually require you to tie your money up for a certain period of time in order to secure a better interest rate on the product. Stocks and Shares ISAs don’t usually tie you into a fixed investment period, so you should be able to have fairly quick access to your cash by simply selling your investments and transferring your money out of your ISA and back into your bank account (keep in mind that the transfer may take a few days to complete and some firms may charge withdrawal fees). There is one caveat to this, though, and this is that stock markets can be volatile at times and if you do need fast access to your money, then you might be forced to sell your investments at the ‘wrong time’ and lose money because of this. So, although you do technically have easy access to your cash with a Stocks and Shares ISA, it may not turn out to be that straightforward if you’re looking to achieve certain investment goals. Remember too that you can’t just withdraw money from Junior ISAs – whether it be an Investment or Cash ISA – as only your child can do this when they reach the age of 18. If you want to move the money you have saved or invested for your child then you will have to do this by transferring the account to another provider. You can have both an Investment and a Cash Junior ISA at the same time, though. Are You Prepared to Manage Your Money? Our final point to help you in deciding whether a Cash ISA or a Stocks and Shares ISA is going to be the right choice for you is related to how much time – or desire – you have to manage and watch over your money. As we mentioned earlier, when you place your money into a Cash ISA, you do so knowing that any initial or regular deposits that you make are going to be safe and that as long as they’re covered by the FSCS, you can rest easy and simply watch your money grow. With a Stocks and Shares ISA, there’s a chance that you might need to spend a little more time and have a little more knowledge available to be able to successfully manage your investments. This is not always true, though, as a lot of this depends on which Stocks and Shares ISA you opt for. Some Stocks and Shares ISA providers like Hargreaves Lansdown*, for example, offer a Ready Made ISA* which takes the hassle out of the investment process and with robo-advisors like Wealthsimple* now also offering low-fee Stocks and Shares ISAs, it is more than possible to invest via a Stocks and Shares ISA in a truly hands off way. If you go for a DIY ISA* where you pick and choose how you would like to invest your cash, however, then you will need to be prepared to take charge and manage your investments yourself. So, having said all of the above, would a Stocks and Shares ISA or a Cash ISA be the right option for you? Well, that’s your call but here are some quick points to sum up. If you are an extremely risk averse person and you want to be absolutely certain that you will not lose one penny of your savings, then a Cash ISA would likely be the right call for you. If you don’t mind taking a little risk in the hope of better rewards, a Stocks and Shares ISA might well be suitable. If you want to take a hands off approach and leave the hard work to someone else then a Ready Made ISA* or an ISA from a robo-advisor like Wealthsimple might work well for you, but if you’d prefer to make your own investment decisions then you may be better off opting for a DIY Investment ISA* instead. 2 Responses to Stocks and Shares ISA Vs Cash ISA – Which Is Right for You? As they aren’t mutually exclusive, how about both? I have a help to buy ISA yielding 3.5% pa and I have a stocks and shares ISA. The plan is to move to a S+S ISA with lower fees in the new tax year. I think people on high incomes who plan to max out their ISA limit every year should choose the S+S option. Their first 1k of interest in a regular savings account will be tax free anyway! Certainly not against spreading your cash across both if you want to balance risk with reward that way.